Darasak is Thai, and he was feeling a bit nostalgic and decided to turn our boring chicken thighs into something tantalizing. 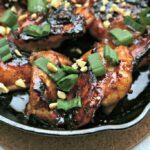 These chicken thighs are sweet, spicy, and tangy. With a touch of peanuts and ginger, it doesn't get better than this. You have to try it! Start by pouring in the 1/2 Thai-chili sauce, then proceed to add the 1 tbsp of soy sauce of your choice. Add garlic to marinade, either whole or minced. Cut a lime in half and squeeze all the juice from both halves into the marinade. Add a tbsp of agave syrup into the bowl. Don't forget the heat and add 1 tbsp of sriracha to the mix. Add all spices to the marinade and whisk until it is completely mixed. It's ready! Set aside some sauce for serving. Add the chicken to the marinade. Let it marinate for 30 minutes to an hour. Once it is marinated, add 2 tsp of olive oil into pan and sear chicken for 3-5 minutes on each side until it chars. Place chicken in oven-safe skillet and into the oven and bake for about 15 to 20 minutes and until the chicken is no longer pink and a glaze is visible. While it is baking, finely chop up green onions and peanuts. Chop the lime into wedges. You will need this for serving! Once the chicken is cooked, it's time for the finishing touches. Add chopped green onions and peanuts on top of the chicken. The glaze is nice and sticky so it will stick and be ready to eat. Place a portion of steamed white rice, top it with 1 or 2 chicken thighs and use your fork to cut the chicken. If using chopsticks, cut the chicken thighs before placing it on top of the rice. Drizzle with leftover sauce, squeeze the lime on top and enjoy!